This kind of question presents the user with an image. In order to answer the question, user has to click particular spot on the image. There are no visible clues unless it builds with an image itself. The user has to know which part of the picture to select, without relying on suggested answers or other guidance. 1. 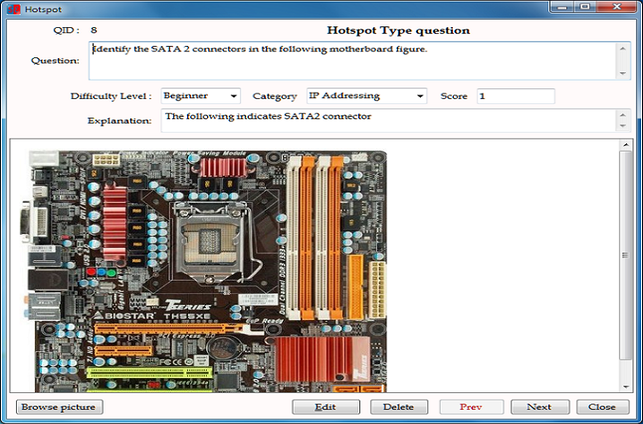 Entering a new question : To enter a new question select "Hotspot" under "Choose Question Type" in Author/Question Type screen and click on "Add New/Insert". Question : Enter the main question in this field. Browse picture: Click on this button to browse to a location and select the image for this question. Once the image is selected it will be displayed in blank area. To select the correct answer spot on the image double click on the rectangular box and move it to the answer spot on the image. Difficulty Level : Use this option to select difficulty level for the question to Beginner, Intermediate or Expert. Default value is set to Beginner. Category : Use this option to assign this question to a specific category (topic). By default first category is selected. Score : This field shows the score assigned to this question. Explanation : Any explanation for the question can be entered in this field. To save the question click on "Save" button. Previous and Next buttons can be used to navigate to other questions and insert new question at specific place in the database. Close button can be used to exit without saving the question. 2. Edit an existing question : To edit an existing question select select "Hotspot" under "Choose Question Type" in Author/Question Type screen and click on "Edit/Delete". A new window will open and display the first question present in this question type. Use previous and Next button to navigate to the desired question. Make required changes and click "Edit" button to save the changes. Use "Close" button to exit without saving. 3. Delete an Question : Follow the steps to open the question for editing (Edit an Existing Question) and click on "Delete" button to remove the sub question from the database.